Dahurian Birch is a rare and interesting ornamental with curling bark. This tree is the first to sprout on bare land and is tolerant of dry, gravelly, and infertile soils. Dahurian Birch can grow in industrial areas or exposed land as long as it has full sunlight. This tree is ideal for landscaping, ornamental, and ecosystem services. 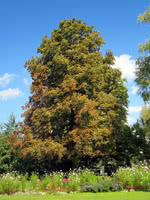 This tree is not well known, but is a favorite of nursery owners across the country.